Now I understand better what is actually happening during loading time. I'll move a few mods around to see if it gets better. 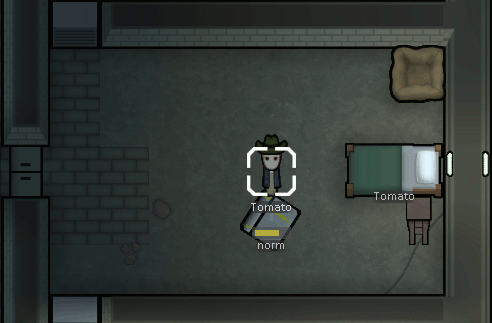 RimWorld / Help / Re: Is xpathing extremely important? RimWorld has a built-in mod system that uses xpath technology to let you specify part of the XML tree to replace/add to/delete/etc. It makes it fairly easy to make changes to the XML and then share them with other people. If you are making a mod for only yourself, you can do whatever, but if you want to share it...if you change the XML, how can you do that? The system is set up so you can publish a series of xpath patches and then anyone can use them. I don't even know how else you would do it? If two people want to change two parts of a weapon's definition (one how much damage it does, one the graphic), they are both affecting the same XML file. So a 3rd person can't just use their XML, because one will wipe out the other's changes - the graphic change would specify the original damage, etc. PS - it's still quite easy for xml patching to step on others' toes: one mod may make a change to one part of a weapon...and another mod may remove that weapon entirely. If they happen in the wrong order, the mod that changes the definition will be very unhappy because it cannot find the weapon. It just means they can both touch the same file/definition in general. - moved ModCheck to load it before Core. - moved RimQuest above RimWriter to avoid clashes (is now gameplay, instead storyteller). database now knows about 1282 mods. 1. Overwritten stuff with XML = bad because it can conflict with other mods. Adding new stuff with XML however is not a problem. 2. Using XPath, if done properly, will virtually never (or never at all) conflict with other mods. So yes XPath is very important if you use more mods or intent on sharing it with other players. Also, add a toggle on transport pod launchers to automatically rebuild the pod when it's launched. Is it compatible with Psychology mod? Also, I'm curious about how it could influence factions, if it does at all? Or is all about the single pawns? 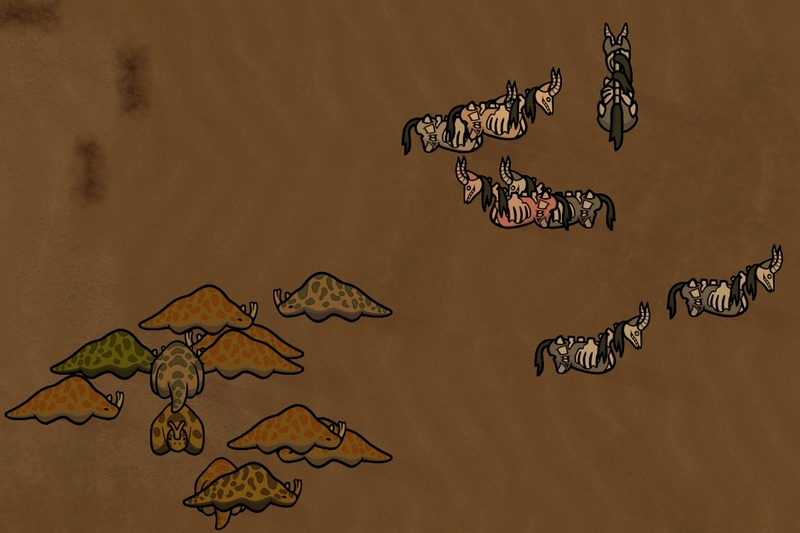 Bonus Kodos and rare variant skeletal horses. Abrasive - As well as the existing slight/insult increases, Abrasive pawns would now be more likely to make romance attempts, for better or for worse, with an increase to the chance that these attempts succeed (as it could be seen as courageous by the one being romanced). Annoying Voice - Two pawns with this trait will feel a connection with each other, instead getting an inverse +25 positive relationship bonus. Body Purist (and Transhumanist) - No longer consider prosthetics (that is, parts worse than their natural counterpart), a machine part for the purposes of both Body Purist's penalty and Transhumanist's bonus. The fact that a Body Purist will feel that they're a spooky robot monster or a Transhumanist will feel like their machine body is becoming more complete when you install a cochlear implant on them is not only silly but not particularly balanced either. Not to mention, a Body Purist being upset that they're having arms at all in prosthetic form as opposed to stumps from being in an explosion is infuriating, and makes the current Body Purist one of the traits I refuse to have in my colony. If it were changed so that only bionics applied these penalties/bonuses, it would be much more palatable. There could also potentially be a small mood bonus of say, +4 for Body Purists who don't have any bionic parts to mirror Transhumanist and make it further less of an issue. Chemical Fascination - Chemical Interest does what this trait does much better, so I suggest removing it. 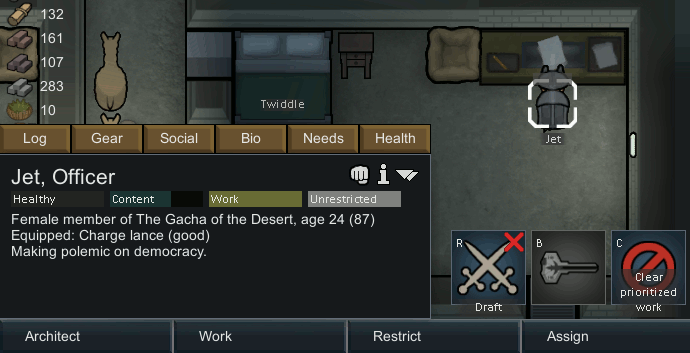 I'm well aware that there are plenty of people who OD from binging drugs in real life and that this trait is perfectly realistic, but it's just not fun and is a complete nightmare to have in a colony. Chemical Interest - Despite my previous comment, this trait could also use some work. I suggest axing the 'ignores drug policy' part of this trait, and only have that when they go on binges or are addicted to something (I'm not sure if this is how it works already or not though). I also think both given the downside of random drug binges and the description of this perk that they should mechanically receive more of a benefit from pleasurable drugs. Perhaps, they could get 150% of the mood benefit that a normal pawn would receive from taking pleasurable drugs. Creepy Breathing - Same as Annoying Voice (but for two pawns with this trait instead of course). Depressive and Pessimist - Since there are purely positive versions of these traits, I think these are OK to keep as they are, though I would not turn my nose at the removal of all of them. Gay - A most controversial trait indeed, and one that I too don't believe needs to be a trait. If this was handled with a variable (hidden or visible I'm not sure, but either work), it would be much better, especially if there were more options than straight/gay (the Psychology mod does this well). Gourmand - The hunger rate difference for the Cooking skill increase was fine. Why make them have forced binges on top of that? I personally don't believe that's necessary. Misandrist/Misogynist - A +10 or +15 mood bonus for pawns of the same gender as the pawn with this trait would balance these out in my opinion, and I think they should be mutually exclusive (as funny as it is when you see a pawn with both). Nervous/Volatile - Similar to Depressive and Pessimist, since it's an inverse version of a positive trait, it's less of an issue, but in this case I certainly see no reason to have them, especially so with the existence of Neurotic/Very Neurotic that achieve what Nervous/Volatile set out to do but with a balancing measure. I'd also prefer an inverse version (slower working but lower mental break %s) to the positive counterparts, but that is of course less of an issue. I don't have the same problem with Lazy/Slothful (and by extension Hard Worker/Industrious) as they have an interesting social interaction by way of the 'hard worker vs lazy' penalty. Pyromaniac - The one anyone reading this was expecting most I'd assume. It may surprise you that I think the solution is easy though. I believe that Pyromaniacs should receive the catharsis mood buff regardless of if their firestarting spree was caused by low mood or just because they wanted to, and that they chance that they go on a firestarting spree should be 0% if their mood is maxed. Sickly - The trait you'd never take on in a jungle environment, Sickly is perhaps the biggest offender to me, since self-tending is less effective than having another doctor (even of slightly less skill) patch them up. This means that the paltry bonus to Medicine that the trait grants hardly makes a difference to how annoying the trait will be to deal with. I personally see no reason for this trait to exist at all, but if it did, then having it be a reversal of Super-Immune and granting slower immunity gain speed would be far, far less egregious (since at least that way the pawn would die off quicker, haha). Staggeringly Ugly - As with both Annoying Voice and Creepy Breathing, a similar social change could work here. Pawns with this trait should receive no social penalty (if the pawn they're socially interacting with is Ugly) or +20 (if the pawn they're socially interacting with is Staggeringly Ugly). I also think the Beautiful trait should function similarly with Pretty/Beautiful pawns (since stereotypically attractive people tend to be competitive with one another). Ugly - Very similar to the above there should be no social penalty (if the pawn they're socially interacting with is Staggeringly Ugly) or +20 (if the pawn they're socially interacting with is Ugly), and that the Pretty trait should function similarly. Teetotaler - This is the least offensive negative trait to me, but if any love was needed for it, a small mood bonus, '+3 - Clean' that occurred if they had taken no alcohol or pleasurable drugs in a certain amount of time (30 days or a year maybe?) would be nice to have. I'm not sure if this is the case already, but if not, having Teetotalers never start with an addiction when they first appear would be a nice touch too. Wimp - To help this trait in the way I can think of, it would need a little bit of a thematic change. The description of the trait would become something like "[pawn] doesn't have the thickest skin, so prefers to stay out of the way to avoid being hurt. ", and it would give a small (10% maybe?) increase to the range of weapons that use the shooting skill, as well as the existing penalty. Additionally, even though the two traits aren't mechanically opposing, having this trait appear with Tough seems really odd to me thematically, so perhaps that shouldn't occur, but it isn't exactly an issue. Anywho, that's all the traits I wanted to cover, so if you have any questions/comments/concerns feel free to voice them below. Adds political ideologies as traits which create harmony or conflict among pawns. Colonists (almost always) possess one of nine principal ideologies which determine their worldview and how they view their fellow colonists. Colonists with vastly divergent politics will loathe their time together while colonists with very similar or the same politics will find life easier to manage together. Neolithic tribes and pirates also have more limited typically anarchistic or autocratic political opinions which can put them at odds with more civilized brethren. As long as you are willing to invest the time, political opinions are not set in stone. Intellectual pawns can be committed to writing persuasive "polemics" which are crafted from leather at a crafting spot or the new writing desk. While not guaranteed to work, less intelligent pawns are frequently swayed by a polemic of higher quality. Also, during moments of great duress, a colonist may have a crisis of confidence in their ideology and change political opinions as well. Shrew Tol was exiled from his tribe and left naked and alone in the swaying grass and blistering sun of the savanna. Yet over the years his home became the fortress of White Rock, carved from a great spire of limestone deposited by the receding of an ancient ocean whose last wave lapped the shores of his home planet billions of years in the past. Here he established his tribe the Gacha of the Desert and here he tried to build a better community than the one that cast him out. Here he met Hokojin "Jet" Buraku, who grew up enslaved in a junkyard and who ran away to join the military as soon as she was old enough. Alas, her ship was destroyed in the atmosphere of Shrew's planet and there she crashed to the ground just outside the wooden palisades that would one day be replaced by the magnificent white walls of White Rock. She and Shrew became fast friends and once she explained democracy to Shrew, he insisted that she explain it to everyone else at the Gacha as well. Jet went to work immediately at the writing desk in Twiddle's room. While Twiddle would rather the Gacha organize itself as a free republic, she nevertheless was more than happy to let her do her writing in her room, well lit, remote and free from the distraction of wandering cave alpacas. Feeling the pressure, Jet understood that the fate of democracy on this small and turbulent planet could possibly rest on her very shoulders. After a little effort, she finished her latest piece. 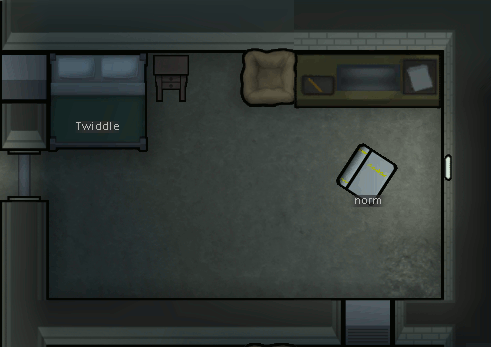 It was certainly not her best work but it was an adequate polemic written on the finest thrumbo vellum. She then went to find her friend Tomato and insist he retrieve it and read it as soon as possible. Tomato read the book later that evening. As it happened, Tomato was not perturbed by the average quality of the work but rather found Jet's polemic on the virtues of democracy to be a very compelling work. Immediately, from that moment forth Tomato fancied himself a proponent of democracy, and now that he knew Jet also subscribed to that worldview, they surely would get along better knowing that they had a common vision of the future. Very special thanks to helpful Ludeon Forums members Mehdi and LWM for helping me out with some of the code. Without you this mod would never have been finished so thank you both very much.